Tom Northcott is a Vancouver folk-rock singer with hits on the local pop charts from the mid-60s into the early 70s. He became known to a Canadian audience by his regular appearances on CBC Television’s Let’s Go music program in 1964-68. He was nominated as best male vocalist for a Juno Award in 1971. Later he co-founded Mushroom Studios in Vancouver and produced records. His hits are played regularly on Canadian oldies music stations. Born in Vancouver in 1943, when he was in his teens Tom Northcott was gaining a reputation performing on the Vancouver coffeehouse circuit in the early ’60s. In particular, he was a regular in the Kitsilano neighborhood, the nexus of the hippie scene north of San Francisco. In 1965, Northcott took over from Ronnie Jordan as the lead singer for the Vancouver Playboys, a group that wore identical suits. The Vancouver Playboys were an exciting new band that fused the Beatles look with music resembling of The Ventures (of “Walk Don’t Run” fame). Northcott founded one of Vancouver’s first labels, Syndrome Records. Warner Record executives in Los Angeles were amazed at Northcott’s savvy and offered him distribution. While the Playboys toured the country that summer and fall, the label served home to their first single, “Cry Tomorrow.” It was the first of eleven Top 30 hits on local AM radio stations in Vancouver. But by the end of the year Northcott left the band. With a 12-string guitar, Northcott formed The Tom Northcott Trio with drummer Chris Dixon and Rick Enns on bass. They were soon regulars on CBC TV’s Let’s Go program. Meanwhile they were selling out the top clubs in the area like The Afterthought in Kitsilano. The Tom Northcott Trio traveled to California and played gigs in San Fransisco and Los Angeles. This exposure got them further performances as and they opened for The Who, The Doors and Jefferson Airplane. In December 1965 they released “Just Don’t” (song #1106 on this Countdown) to overall good reviews and it charted on both CKLG and CFUN peaking in January 1966. His next song, “Goin’ Down“, with the Tom Northcott Trio, has been reviewed at position #1133 on this Countdown. 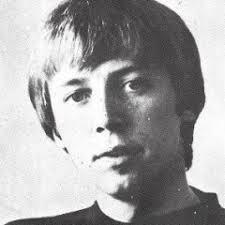 His biggest hit song was the sunshine pop psychedelic tune, “Sunny Goodge Street” from 1967. It became his signature tune. Other notable hits were in the late 60s were “1941” about family patterns passed on from a father to a son, and “Girl From The North Country” about someone who asks a friend to check up on a long lost love who lives far away. “Girl From the North Country” was written by Bob Dylan. It was first released in 1963 as the second track on Dylan’s second studio album, The Freewheelin’ Bob Dylan. Dylan re-recorded the song as a duet with Johnny Cash in 1969. That recording became the first track on Nashville Skyline, Dylan’s ninth studio album. In December 1962, Bob Dylan traveled to England and he wrote “Girl From The North Country” shortly after work on his second album. It is debated as to whom this song is offering a tribute. There is speculation that Dylan’s former girlfriend, Echo Helstrom, is the subject. Others suggest it must be Bonnie Beecher. Both women knew Dylan prior to his move to New York. However, the consensus is that Dylan was inspired to write about his girlfriend at the time, Suzie Rotolo. Their relationship was trans-continental. Dylan traveled from England to Italy in search of Suzie. Her decision to pursue her studies had been a source of tension in the relationship. As it happened, Rotolo left Italy coinciding Dylan’s departure for Italy. She was traveling back to America. When he got to Italy and found Suzie no longer there, he finished composing the song. In the new year of 1963 Bob Dylan was back in New York City and talked Suzie Rotolo into giving their relationship another chance. She moved back into his 4th Street apartment. Upon his return to New York in mid-January, he convinced Rotolo to get back together, and to move back into his apartment on 4th Street. When The Freewheelin’ Bob Dylan was released in May 1963, Suzie Rotolo was featured on the albums’ cover with Dylan walking down Jones Street, near their New York apartment. During his stay in London, Dylan met folksinger Martin Carthy, from Hatfield, 50 miles north of London. Carthy had built up a following singing traditional English folksongs. In the 1980’s Dylan recalled, “I ran into some people in England who really knew those songs…. Martin Carthy, (he’s) incredible. I learned a lot of stuff from Martin.” Carthy introduced Dylan to the world of traditional English ballads, including Carthy’s own arrangement of “Scarborough Fair.” Dylan was inspired to put the melody of his new lyrics in the genre of the traditional English ballad. This including the line from the refrain “Remember me to one who lives there, she once was a true love of mine.” Musically, this song closely resembles to his composition, “Boots of Spanish Leather”, recorded on his 1964 album The Times They are a Changin’. 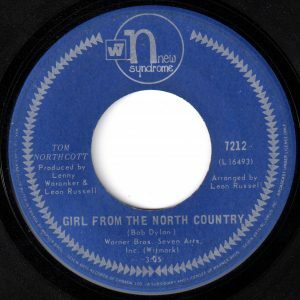 Tom Northcott covered “Girl From The North Country”. It spent two months on the CKLG survey in Vancouver, climbing to #7. Northcott changed Dylan’s line “If you’re traveling to the north country fair” to “If you’re going to the north country fair.” Northcott’s cover made the Top 20 in Calgary and got some airplay in east Texas and in Syracuse, New York. Other versions of “Girl From The North Country” include recordings by Link Wray, Hamilton Camp, Waylon Jennings, Mitch Ryder & The Detroit Wheeks and Johnny Cash. By 1971 Tom Northcott had scored ten consecutive Top 30 hits in Vancouver and was on a streak of six consecutive singles reaching the Top Ten. But in 1971 he had his final Top 30 hit, “Spaceship Races,” which missed the Top Ten peaking at #15. The song was written by the songwriting team of Gerry Goffin and Carole King. The week “Spaceship Races” peaked on the CKLG and CKVN charts, Carole King’s double-sided single “It’s Too Late/”I Feel the Earth Move Under My Feet”, and her album, Tapestry, were number one single and album on those local charts. Northcott changed careers in the early 1970s and got a license to become a commercial fisherman in British Columbia. At the end of the decade Northcott ran for public office under the banner of the Social Credit Party of British Columbia in the New Democratic Party stronghold of East Vancouver. He lost the campaign. Once again he switched careers and, after studying law at university, he specialized in maritime and admiralty law. Northcott is now retired and living in Kamloops, British Columbia.